It’s been a busy but a good week for me, raised some money, sold some domains & more importantly bought a few websites which are (touch wood) exceeding expectations. It was only 1 to 2 years ago that I thought although late to the party I should try and do whatever it takes to get a couple of great generic UK domain names, preferably on a budget and with a bit of luck, plenty emails and perseverance I got TVs & PCs & quite a few others. September the 7th 1998 with $100k and four computers Google started up. 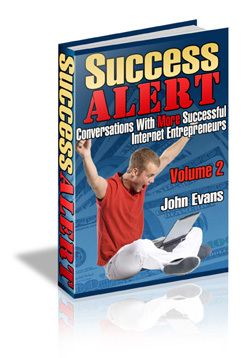 Whatever way you look it it …..it makes me feel like I’ve been in a coma as far as productivity goes, Google has managed to penetrate almost everyone’s lives from mail to maps to writing to even a browser. Personally I have not been overly impressed with much Google has done in the last 2 years apart from the very recent browser Chrome which I have totally switched to and love, that aside considering their muscle, wealth and power they can waltz through failures without breaking a sweat which can be a bad thing, but when they get it right and sometimes they do…they are very very good. Google tool gets even better! 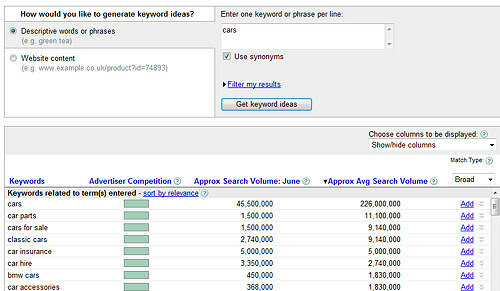 Is it me or is this tool getting even better, to be fair this was possibly already there last week (I didn’t notice), following on from last week when I noticed the keyword tool gave numbers, it was mentioned that some people likes the advertiser competition, well now you can display all the data your going to need with average CPC & advertiser competition. 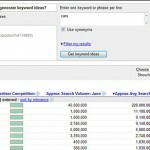 Googles keyword tool has long since been a friend and an excellent resource… and it just got better! In the past the average search data was just displayed as green bars showing most popular terms which has been handy for sure.